"Most Definitely the Most Disturbing Cake I've Ever Made"
Yes, you read that correctly. 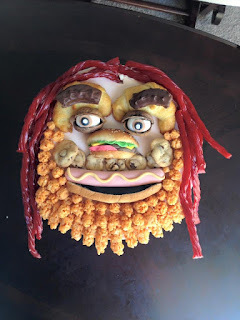 Toomgis. Kimiko commented that "this is most definitely the most disturbing cake I've ever made." 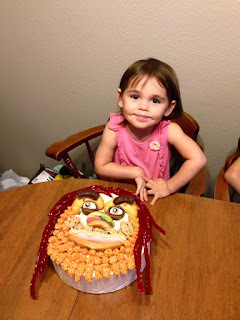 But Karis loved her Toomgis cake and had a great birthday. Too Much Good Stuff! I realize that salads are typically more of a summer meal, but we eat salads all year at my house (plus it's still very much summer where I live). I'm not sure if this is because a) I'm too lazy to actually cook something, or b) we don't really have a true winter here (unless you consider lows in the 50s winter). 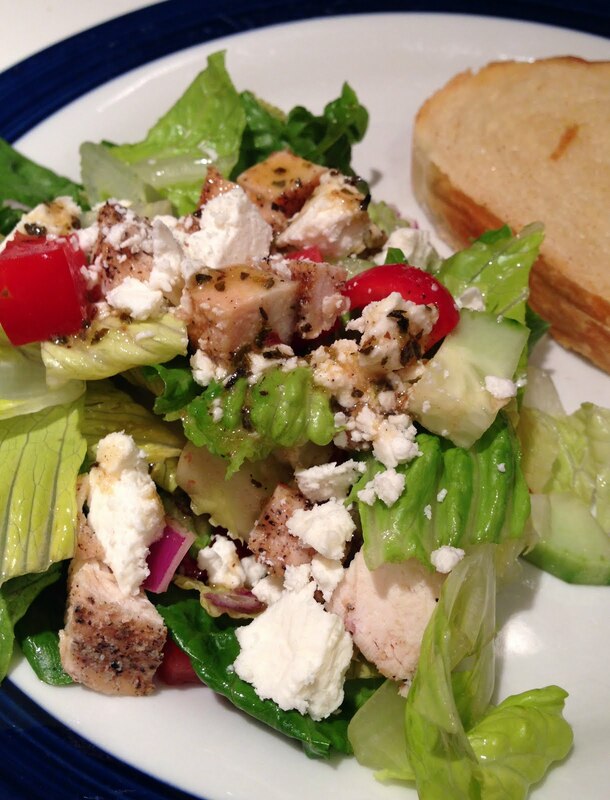 Salads are also economical as they allow a small amount of meat to go a long way. 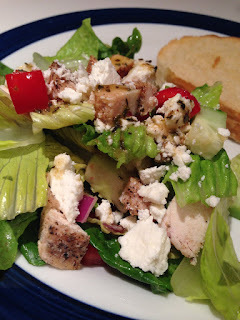 One of our favorite salads is a Greek salad that I posted 5 years ago. It's so good that it really deserves to be mentioned again, but I've tweaked it ever so slightly to make it an entree! I don't know why I didn't think of this sooner because it's so simple. Add some chicken to the salad and, BAM, you've got a healthy and affordable entree! You can use any kind of chicken you want - grilled, sauteed, rotisserie, leftovers, etc. If I've recently made a whole chicken and have leftover meat, I'll use that for this. If I don't have any leftovers on hand, I'll typically season boneless, skinless chicken breasts (I can often get these for $1.66-$1.77/lb on sale so I stock up and throw them in the freezer) with salt, pepper, and garlic powder and sautee in butter or throw them on the grill. And for our family of 5, I can get away with 2 chicken breasts and usually have leftover meat for the lunch the next day. You can use a bottled salad dressing, but I highly recommend you make the dressing below. It tastes a-maz-ing (thanks to my sister-in-law for sharing it with me! ), and it's healthier and much cheaper than store bought dressings. My 7-year-old daughter LOVES it and always asks me if we have *that* dressing, even when we're not having a Greek salad. On an economical note, I realize that Feta can be pricey. I typically buy a chunk rather than crumbled Feta, because it's cheaper per ounce, and let's face it - it's really not hard to crumble your own Feta. I've been omitting the olives as half of my family doesn't like olives and not using them also brings the cost down a bit. Combine all ingredients in a bowl. You can either toss it all with the dressing or have people put their dressing on individually. If you choose to toss the salad with the dressing, make sure you add it immediately prior to serving so that the lettuce doesn't get soggy. Combine all ingredients in a salad carafe and shake well. If the dressing is too tangy for your taste, you can add a little sugar to tone it down a bit. To help prevent separation, you can put all ingredients except the oil into a blender or food processor. While the blender or food processor is running, slowly add the oil. Note: For those doing Trim Healthy Mama, this is an excellent S! First off, our apologies. We haven't posted anything new in over a year. We have a ton of posts to write for you, but our lives keep getting busier and busier. At the same time, we love blogging about food and family and truly desire to continue to do so. We hope this is the first of many more posts to come in the near future. Last summer we started a routine in our house. Each kid is responsible to cook dinner one night each week. They plan the menu, do the prep work, cook the meal, and set the table. When it's time to sit down to eat, one of the other siblings prays for the meal and include giving thanks for the one who did the cooking. When I started posting about this on my personal FB page last summer, I received some questions about how I get my kids involved in the kitchen. At that time, the kids were 11, 7, and 4. So this summer, I've been taking pictures of their dinner nights so I can share with all of you. Of course, you know your own children and their limits and abilities. Since there are a lot of opportunities for injuries in the kitchen, always supervise your children and never let them do anything outside their skill level. At the same time, don't underestimate what they are capable of. Teach new skills by demonstrating and talking them through it. Then help them do it. Finally, watch them do it themselves. Technically, April isn't making dinner in these pictures, but she is involved in the kitchen. And she has become so good at making scrambled eggs, that she can do the whole thing herself. I just light the stove for her because our igniters are broken and we have to use matches. She probably makes eggs 4-5 days a week now. First she collects her ingredients and tools. I love those little hands! The easiest way to end up with shell-free eggs is to break them into a clear dish. This day April was breaking them into my quart Pyrex. Once the eggs are cracked, pick up the dish and look through the bottom. The shells will have sunk to the bottom. You can use a spoon to fish them out, but April and I find it easier to just use our clean fingers. Cooking is a great way for kids to learn math skills in a practical setting. April is just learning to recognize fractions, but the boys are learning how to double and triple amounts when they cook. Another fun aspect of cooking for kids is getting to use the kitchen tools and gadgets. For some reason she used a fork the day I took these pictures, but she is usually really thrilled to get to use the wire whisk. These were plain eggs. She usually makes green eggs with sausage. Just add a few drops of green food coloring and throw some cut-up cooked sausage on top after pouring the eggs into the hot pan. And remember: it is imperative that you let the pan get hot before adding to eggs to prevent them from sticking. See the post here. Heat pan over medium to medium-high heat. Meanwhile, crack eggs into clear dish. Look through bottom to find and remove any shells. Whisk in cream, salt, pepper, and green food coloring if desired. Add butter or oil to heated pan. Pour egg mixture into pan. If desired, toss sausage on top. Turn heat down to medium. Once bubbles start to form, stir to scramble. Cook until desired doneness, stirring occasionally.